EZ Stor® Plastic Containers are ideal when looking for a space efficient storage system. 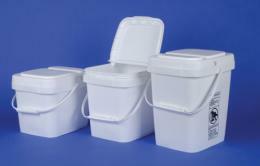 They are FDA compliant and just the container for your food storage or your pet's food storage. Using the handy hinged lids, you can access your product quickly and re-seal with the snap of a finger. Most are made of polypropylene construction, but a couple of out of HDPE. The lids include tamper evident tear tab strips which gives you the ability to know if someone has intruded. These pails are ideal for frequent dispensing and refilling and most of them include handles for easy carrying. Pails and lids are sold separately.